That’s a really good question. I don’t know for sure. However, my guess would be that the taste would not be different. The sauce might be lighter and a touch thinner. If you try it with clear rice vinegar, would you report back and let me know? Good luck. It’s really good. look forward to you making more recipes and posting them! Thanks, Lynn! I hope you enjoy the book as much as I do. I stumbled onto this entry just now…so glad to read that you are enjoying the book. And I love it that you suggest figuring out the meat to lettuce greens ratio you want with this salad. Recipes are guidelines; you should be able to trust them, if you need to be exact, but they’re there to give a foundation from which to explore. Yes, I’d substitute an apple cider vinegar perhaps, or rice vinegar and the smallest dash of say Spanish Sherry vinegar to get that deeper note. Dear Naomi, you do my blog much honor by “intruding” here. I recently bought Hot, Sour Salty, Sweet, which has joined Beyond the Great Wall and Ottolenghi’s Plenty on my counter. They are the books I use most lately. But they also stand in my personal pantheon of Great Cookbooks, right alongside Marcella, Zuni, and a few others. You also inspire me to make a trip to Southeast Asia on my own at some point to eat and look. I’m not sure how to go about organizing it from a culinary perspective, but, as a woman in her mid-fifties, I read your books like an armchair adventurer. Only, I intend to get out of the armchair… So, thanks for your comment, your books, and example. That is very kind of you. Down the road, perhaps. No, I did not know about EatingAsia, but I do now! And that is exactly the sort of thing I’m looking for. My ideal trip to SE Asia would begin and end with several days of ramen in Tokyo. You’ve given me incentive to plan a trip next year. Thanks. Holy moley, what a great blog EastingAsia is! I have a road map right there! Isn’t it? And they are great people too. You might want to follow them on Twitter… if you do that kind of thing. I might, although Twitter isn’t really my thing. Nor is FB. But giving up FB means losing touch with all the elementary, high school, college, and new friends I found through it. So, I check it once or twice a week. On another note, nine years in Toronto (two of which on the Danforth) in the 80s and early 90s opened up the world of food to me. I miss the city. Came within a hair’s breadth of a citizenship judge, but having to take a a job in the US blew my landed status. I saw photos somewhere (your book? An article?) of what I believe is your kitchen. I wouldn’t be surprised if you lived near my professor at UofT, Andrew Watson. It looks like that kind of old, narrow house. Tomorrow I leave for 16 days in the UK, including 7 days on the coast of Devon with friends but without wi-fi. It’s been a long time since I’ve been unplugged. The fish will have to compensate. However, there’s a 12 hour flight from SFO to LHR before that. Love all references to your recipes. Always want more menu information. You frequently mention thai beef salad and sticky rice, but not other things to go with it. In the last few months, you were planning such but were wondering what to serve with it. We never found out. Just last week, you had it at a party. The meal ended up as thai beef salad, sticky rice, nam prik num (SOR), and a Burma book eggplant dish. I substituted makeua oop (also almost Burmese) from HSSS and added the red curry chicken with lots of long beans added to it. There is lots of menu information in MCL, but not for southeast Asia. All menu references are welcome. Good suggestion. I will look into menu suggestion when I return home from my trip. Thanks. Hello again! I made this GREAT dish a couple of nights ago. Odel was particularly complimentary about it – LOVED, LOVED it. 🙂 As did I. Following Naomi’s comment above, I substituted half “usual” rice wine vinegar and half Spanish sherry vinegar for the black rice vinegar. I don’t know how it is supposed to taste, but it tasted fabulous. 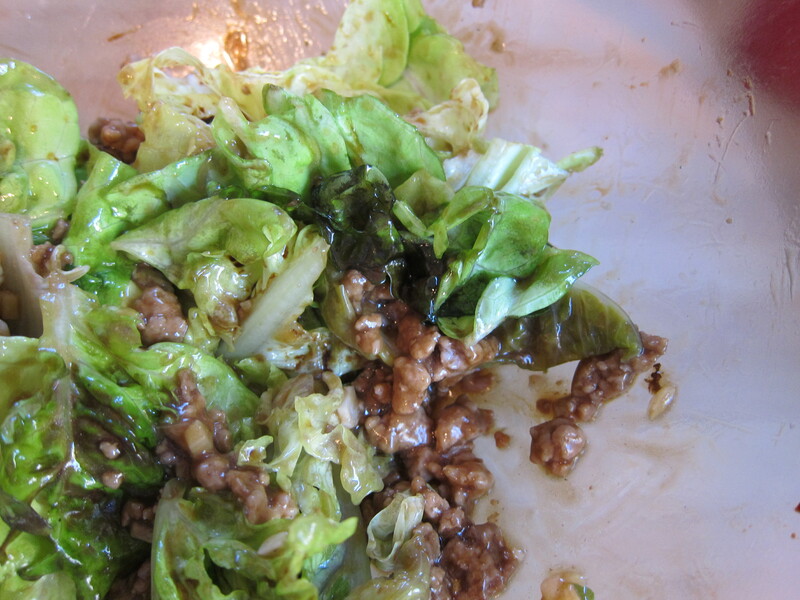 I made it with 6 cups of lettuce (romaine), 1/2 pound of ground all-natural pork from Eugene’s farmers market, and the same amount of sauce, which was sufficient for the extra romaine. Along with a fresh baguete and butter, fed two hungry individuals. Unless I am blind, you left out one ingredient: the oil used to saute the ginger and garlic. I googled Beef-Sauced Hot Lettuce Salad and found another bloggers reprint of the original recipe, which includes 1 T of peanut or vegetable oil. She served it with rice as an entree (and used beef). I think I might try that next, with 4 cups of lettuce, served on brown rice seasoned with a little Ponzu sauce. Very versatle recipe! That’s fantastic, Laurie! I’m on the coast of Wales at the moment,however. As soon as I return home, i’ll investigate the whereabouts of the missing tablespoon of oil. msitter: I think you were talking to me when you said there was lots about beef sald and sticky rice, but what else to serve with? I’m sorry I’ve let time go by on this. The Burmese eggplant salad is a classic from there: grilled egplant strippped off its skin then mixed with thinly sliced shallots that have been soaked 10 min in cold water; and fried shallots, and a little shallot oil, lime juice, dried shrimp powder, chopped roasted peanuts… Generally if I’m making grilled beef salad I’ll put out fresh things with: other salads from SE Asia and then plain green leaves raw or cooked, and lightly dressed. Sticky rice makes all grazing easy, and intense flavours are the best, so salsas of various kinds, from Jaew bong (in HSSS) or any other in the nam prik family to Mexican, all work.